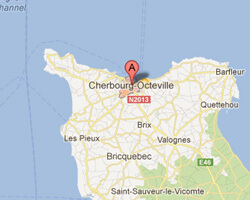 Cherbourg-Octeville is located at the top of the Cotentin, close La Hague cape, 120 kilometres from the English coast. This historical town has always been dedicated to the sea, with a passenger port and a marina. The Gulf Stream warms the climate and allows the cultivation of exotic plants. The “Cité de la Mer” presents giant aquariums and a collection of underwater vehicles. At the seaside you can find Collignon beach, in Tourlaville. 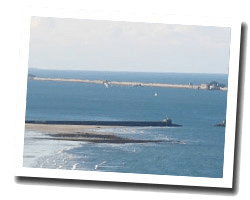 In Cherbourg enjoy a seaview holiday rental. Rooms and apartments at the residence are soundproofed and have a bathroom with shower. They also offer flat-screen TV with satellite channels and free Wi-Fi internet access. Loft located 100 m from the sea in Cotentin, with panoramic views of the sea. Besides all the comforts of a functional house, the house offers warm strengths. For the cooler seasons the second floor, with its rotating fireplace, you can admire the fire while watching the coast. The fireplace can also be oriented bath. 2 Bedroom(s), 2 double bed(s). short stays possibility. Final cleaning possibility.